Welcome to my new feature! Every Monday, I will be posting a tutorial, large or small, on whatever subject catches my eye. Feel free to email me and give suggestions on what you'd like to see at karah99@gmail.com. 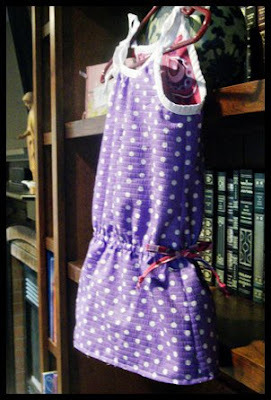 I've been wanting to try to make a few reversible dresses for Aubrey. There are a couple cool things about this. First off, you don't have to decide between two fabrics. You can use them both! Plus, you get two dresses in one. Secondly, it hides all the seams inside, so it looks all nice and neat. Mostly, I just like it because it's cool. Ok, first off, you are going to need approximately twice the yardage (depending on the pattern). Here are my coordinating prints. One is a pillow case picked up at a thrift store. The other is a seersucker fabric that I picked up on sale at Hancock. 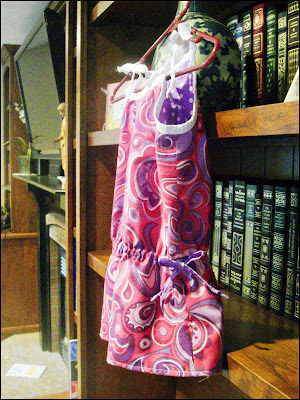 There are some really cute pillowcase dresses around, but I cut the seams on mine and used it purely for the fabric. Step 1: Pick your pattern. Pick one that's simple. You can do sleeves, but I think it's better to do something sleeveless, especially for the first time. Collars would be hard to make work. So would belts, front buttons, pleats and any bulky notions. My pattern has bias tape binding on the sleeves and collar. Makes it much easier. Zippers will work, but I didn't address them in this tutorial. Other than the size being too big for Aubriana, I love it. Bought it from Walmart's craft section. 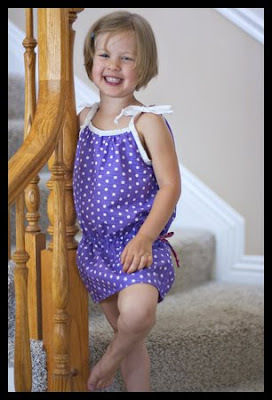 I did size it down to to make this dress, but thought she might have grown into it a bit more by now. But not so much. It ended up being 4T size. I know, because I made Griffin try on the finished dress to check. I'm going to give the directions for this pattern in particular. With a little thinking, I'm sure you can apply this technique to other patterns. 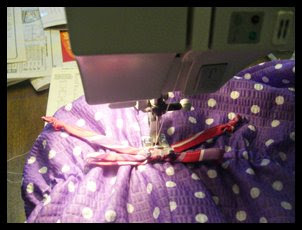 I'm not through with this subject--I have another post planned with another example and a tute for the way I did buttons. You're going to want double the main pieces. If there are any facings, ignore them. I cut one set out with the paper pattern, then used the first set to cut out the 2nd set. I hate paper patterns. They tear easily and they are like maps--so annoying to try to figure out how to get them back together. Even worse than maps, because you remove large portions. 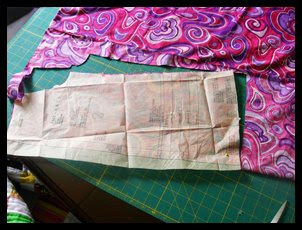 Follow the directions to sew the main pieces together. Mine starts with the side seams. 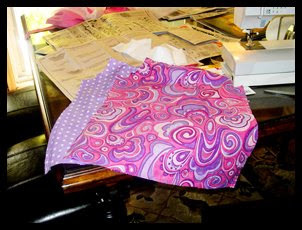 Sew the pieces of the same fabric together, as if you were sewing two dresses. The neckline is usually the next part to be sewn. My pattern has them gathered. 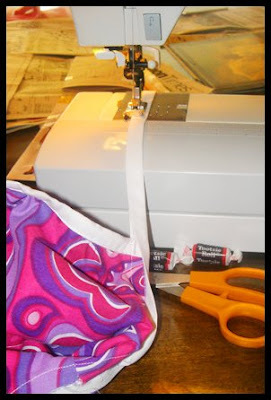 If you are using binding, you will want WRONG sides facing. 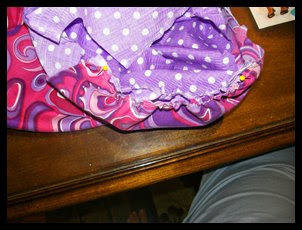 This is part of the beauty of using bias tape for reversible clothes. There isn't any turning. 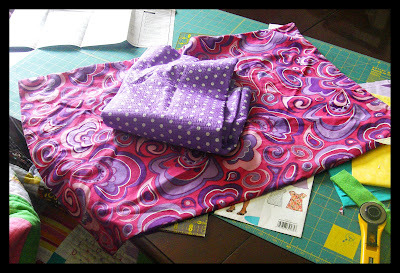 A picture of my front gathered and pinned, ready for the binding. You can buy double fold bias tape at the store, but I was out, so I made my own. It's really simple, just a lot of ironing. I cut 2" strips, sewed the strips together into a very long strip, then ironed them in half, then I made the edges fold into the center and iron them. Another picture of the process. You can see the layers here. Turn piece over and stitch other side of bias tape down, close to the edge. Step 7: Repeat with back. Do the same thing you did for step 5, leaving a 12" tail on each side, around the arm opening. Stitch starting at the top of the neck binding. I deny any knowledge of those toostie rolls and most certainly did not snitch them out of the stash my mom keeps for the grandkids. Nope. I have a magic tootsie roll fairy. I swear. Step 9: Finish the arms. I tried sewing wrong sides together and then leaving an opening to turn, but I got some weird Mobius strip that turned and turned and never came out right. That's ok, I unpicked it and figured out the right way to do it. 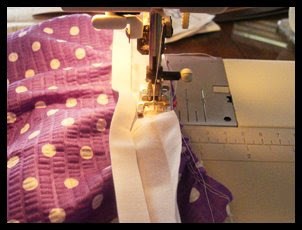 I think the best way to do this is to iron your the seam allowance for your hem on both sides. No need to turn it under again to hide the raw edge, because it's going to be encased in your hem anyway. You do need to be super precise, otherwise, it's going to affect the drape of your garment. 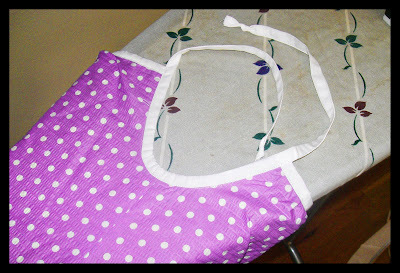 So, iron both sides under, then top-stitch over both at the same time. A picture of the hem turned under. 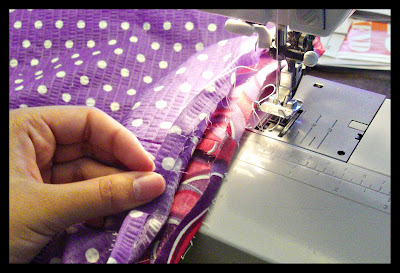 Sewing the hem together. Sorry about the wonky small pictures. I can't get them to behave. Step 11: Casing for elastic. My pattern has a faux drawstring done with elastic. This was even easier to do with my modified pattern than with the original pattern. Mark on the fabric where the casing goes. Sew one long line around the waist of dress, like so: Sew a second line 3/8" or so from the other line. Step 12: Add the elastic. 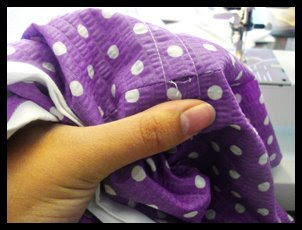 Using a seam ripper, carefully remove the stitches between the lines on the left side seam, on only one fabric. This forms the insertion point for your elastic. 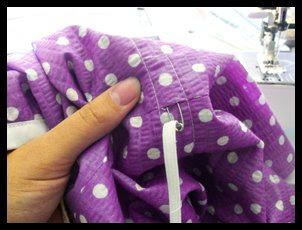 Add a safety pin to the correct length of elastic and thread it through the casing. 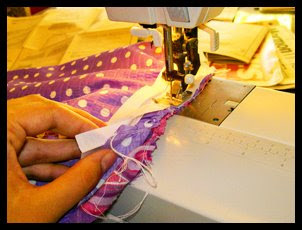 When you get back around, sew the ends of the elastic together. Trim. If you stretch it a bit, your elastic should disappear into the casing. Don't worry about the hole. We're going to put a bow over it. Step 13: Adding bows on both sides. 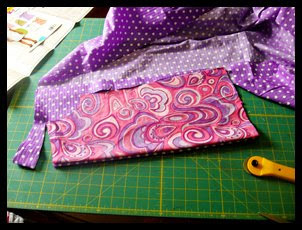 Cut a strip approximately 15" x 1.4" from each fabric. 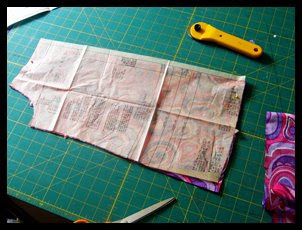 Using the same method as for bias tape, fold it to hide the ends, then stitch along the length. You can do a tube and turn it, but I'm not a fan when working with such small widths. Tie into a bow. Knot ends and trim. 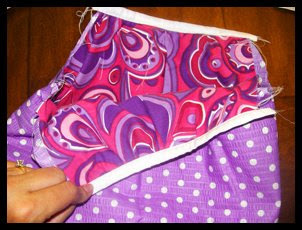 Sew to your dress on the left side, using the opposite fabric. The bows aren't bulky, so they won't mess with the drape of the dress. Step 14: Show off and admire your work! I can't decide which side I like better! Since it doesn't come anywhere close to fitting Aubrey, I'm putting this one up in my etsy shop (yep, I have one now! It's not stocked too much, but hopefully more in the future). 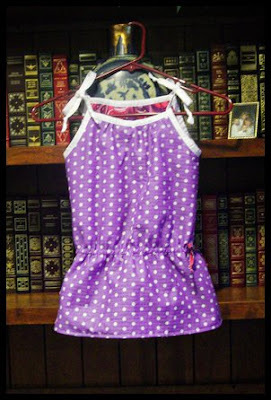 It's size 4T/5T. You can see it HERE. My niece, Maddy, modeling it for me! It would be so dang cute over leggings. Maddy says she likes the swirly side best. You make the sewing thing look easy. I've tried, but alas fabric hates me. Love it! 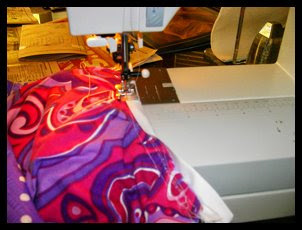 I wish I could sew! My FIL bought me a brand new sewing machine when my son was born and I've never used it! I don't even know how to set it up!! It turned out really cute!! this also for my dgc. 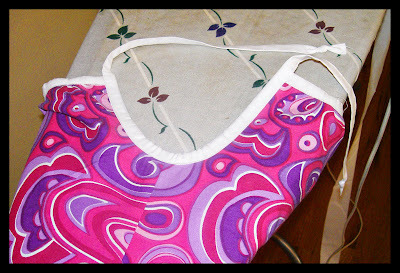 I also have beem wanting to make a reversible pillowcase dresses. I figure it can be done. 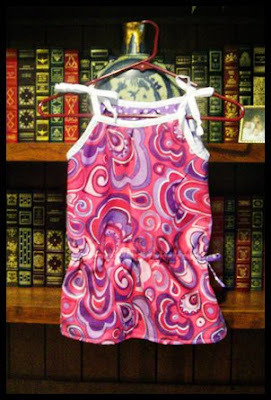 Reversible pants, bloomers, shorts too. It would be so much easier to send two in one outfits to my dgc in Sweden. I love the colors you chose. I must agree with your niece - the swirly side is best! Awesome! 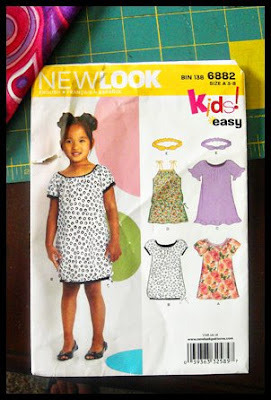 Could you also do a tut on how to make a dress reversible that has sleeves and/or a zipper?